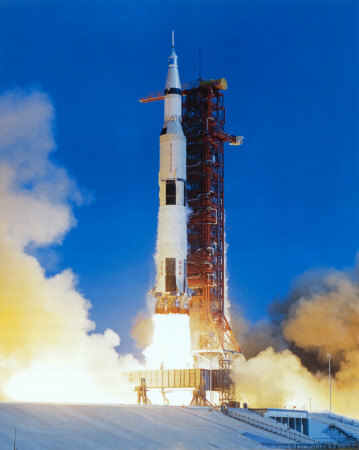 The launch of Apollo 11 in 1969. Because of the on-going dispute over the future of human space exploration, I have been reminded of the longstanding perception that in the 1960s NASA’s Apollo program enjoyed great public support. That is a misconception. The belief that Apollo enjoyed enthusiastic support during the 1960s and that somehow NASA has lost its compass thereafter still enjoys broad appeal . This is an important conception, for without the active agreement of political leaders and at least public acquiescence no exploration effort may be sustained for any length of time. While there may be reasons to accept that Apollo was transcendentally important at some sublime level, assuming a generally rosy public acceptance of it is at best a simplistic and ultimately unsatisfactory conclusion. Indeed, the public’s support for space funding has remained remarkably stable at approximately 80 percent in favor of the status quo since 1965, with only one significant dip in support in the early 1970s. However, responses to funding questions on public opinion polls are extremely sensitive to question wording and must be used cautiously. Nor did lunar exploration in and of itself create much of a groundswell of popular support from the general public. The American public during the 1960s largely showed a hesitancy to “race” the Soviets to the Moon. “Would you favor or oppose U.S. government spending to send astronauts to the moon?” these polls asked, and in virtually all cases a majority opposed doing so, even during the height of Apollo. At only one point, October 1965, did more than half of the public favor continuing human lunar exploration. In the post-Apollo era, the American public has continued to question the validity of undertaking human expeditions to the Moon. This also shows the result of the recent return to the Moon with the Clementine space probe in 1994, which found evidence of embedded ice at the poles, and even then support for human exploration was essentially equally divided. Some conclude from these opinion polls that even though the American public might have been generally unsupportive of human lunar exploration, that Project Apollo—wrapped as it was in the bosom of American virtue, advocated by the most publicly wholesome of astronaut heroes, and hawked by everyone from journalists to Madison Avenue marketers—enjoyed consistent popularity. There is some evidence to suggest this, but it is, on the main, untrue. From the 1960s to near the present, using the polling data that exists, there is little evidence to support an expansive lunar exploration and colonization program. One must conclude from these results that the United States undertook and carried out Apollo not because the public clamored for it during the 1960s, but because it served other purposes. Furthermore, this polling data suggests that should the United States mount another human mission to the Moon in the future it will also be because the mission serves a larger political, economic, or national defense agenda. The only point at which the opinion surveys demonstrate that more than 50 percent of the public believed Apollo was worth its expense came in 1969 at the time of the Apollo 11 lunar landing. And even then only a measly 53 percent agreed that the result justified the expense, despite the fact that the landing was perhaps the most momentous event in human history since it became the first instance in which the human race became bi-planetary. These statistics do not demonstrate an unqualified support for NASA’s effort to reach the Moon in the 1960s. They suggest, instead, that the political crisis that brought public support to the initial lunar landing decision was fleeting and within a short period the coalition that announced it had to reconsider their decision. It also suggests that the public was never enthusiastic about human lunar exploration, and especially about the costs associated with it. What enthusiasm it may have enjoyed waned over time, until by the end of the Apollo program in December 1972 one has the image of the program as something akin to a limping marathoner straining with every muscle to reach the finish line before collapsing. This entry was posted in Apollo, Cold War Competition, Lunar Exploration, Space and tagged 1960s, Apollo, History, Moon, Moon race, NASA, public perceptions, public policy, U.S. Civil Space. Bookmark the permalink. In fact, not it is not just lunar exploration but all of the space program that has had wishy-washy support from the American people. The real issue is: what does it mean for the future exploration and utilization of space? NASA sees 50-50 support for its activities as a problem, whereas I see it as an opportunity. If people are largely indifferent to what you’re doing, they don’t really care where you go, what you do there or how you do it. The key point is that while people are not wildly supportive of the space program, they are not actively hostile to it. Thus, it is incumbent on the agency to craft a program that builds real space faring capability using small, incremental, and cumulative steps. That’s why I think that lunar return to learn how to use the material and energy resources of the Moon and space is a good mission objective. If successful, we will completely change the paradigm of spaceflight, from one-off, PR stunt missions to plant a flag and leave some footprints, to the development of an extensible, useful space-traveling infrastructure, one that can routinely access all points of cislunar space with people and machines. You don’t need ticker tape parades to build a transcontinental railroad in space. Outstanding post. This myth has been destructive over the years. I think the fear of Soviet superiority kept the race going until after Gemini, by which time there had been no new Soviet manned launches for a couple of years. Then came the fire and Soyuz 1, which caused people to question the whole enterprise. Congress took it out of the budget for everything except Apollo – witness the big cuts in AAP and Voyager cancellation. I think Apollo was left alone because so much had been invested and because uncertainty about Soviet intentions remained. Jim Webb played a big role in holding it all together as the budgets began to slump. We got as far as Apollo 17 in part, I think, because of the Soviet robot lunar explorers. This also accounts for our switch to a big robotic exploration push in the 1970s. Again, when the Soviet threat faded, we saw a big cut on robotic exploration. If Voyager (the second program bearing that name) hadn’t given us a periodic glimpses of great stuff as it flew through the outer solar system, I don’t know what would have happened. OK, how does these graphs and surveys explain things like the plethora of space toys that were made, marketed, and sold during the mid-60s/early 70s? Clearly Apollo must have captured America’s support enough for toy manufacturers and model makers to sell huge lots of these things. Revell Apollo models, Estes model rockets, Ideal Star Team Space Helmets, Major Matt Mason, that polyethylene 3 stage rocket with the weird spring loaded Apollo/Gemini kind of capsule. I could go on and on. God knows my Mom and Dad bought enough of them! I think culturally, America was captivated by Apollo, even if only for a brief moment and its something that your graphs cannot show. It’s just that the triumph of Apollo came at the same time of urban unrest, a losing war in Vietnam, a stagnating economy, generational upheaval, and a growing awareness of the ecology. The nascent eco-movement had many wondering if Apollo/SST/V8 Muscle Car style technological progress was worth the cost to the Earth. Great set of comments. I appreciate very much this thoughtful response. It is a bit of a mystery, at least to me, as to why public willingness to support aggressive human spaceflight is modest while manufestations of spaceflight in popular culture are everywhere. We are at present working at NASM on an exhibit about the Space Shuttle and part of it will be toys, etc. from popular culture. They are everywhere, but there seems to be no relationship between these consumer items and public willingness to fund an aggressive spaceflight program. The linkage between such things as space toys with support for the space program is an interesting area to study. To my knowledge, I know of no one who has done so. If anyone can point to research I’d love to see it. Thanks Gene. Ubiquity of space toys tells us nothing about the level of support for the space program per se, other than it’s non-zero. As I note at my blog, if only ten percent of kids like space-related toys, that’s not a very big number in terms of political support, but it’s a huge market for toy makers. You’ve really hit the nail on the head, there. It’s like all the people who thought welfare sucked up a huge portion of the Federal budget, which it never did (welfare, as a specific line item, anyway) back when Clinton ended “welfare as we know it”. People have no idea how much NASA’s budget is or that, for example, the TARP bailout could have funded NASA at its current rate for nearly 50 years (really, in perpetuity, if invested properly). Actually, the portion of the public captivated by the Apollo Program you mention were the children like me that build and collected spacecraft models. Sure, I built a lot of them, but my stepfather viewed it as a waste of time. I was 12 years old when Apollo 11 landed. After that flight most of my schoolmates ignored the program and only one other person in my high school was interested. The fascination with spaceflight died out in my immediate community right after the first moon landing. I have a notion that many people see space exploration as entertainment suitable for kids. They support programs that involve kids in ersatz space experiences. Education has been seen as a big justification for space exploration since Sputnik (and vice versa). It was prominent among the justifications for SEI, for example (which led many to ask, “Why not just spend all those billions on schools?”). However, when time comes to fork out the perceived immense amounts of cash required for actual space exploration, they become more circumspect. Kids have liked space toys since long before NASA was born. Of course, as Gene notes, this reached a crescendo in the 1960s. Hooray for Major Matt Mason! Now, kids still like space toys, but it’s Star Wars. Fictional space adventures attract a lot more dollars than actual space toys. (I’m really curious to see how the new LEGO Space Shuttle kit sells as compared with their Star Wars offerings.) The lesson I take from this is that the moon race was an entertainment for kids. That their parents bought them space toys doesn’t necessarily mean that their parents supported space exploration without reservations. I buy my daughter technicolor ponies, and it doesn’t mean I support dyeing horses. David, I agree with your assessment. NASA has sought to promote its actions over the years through partnerships in the maiking of individual films and through toy development. Some of those items are stunning in their fidelity, others not to so much. I question whether this has moved the needle in terms of public support for spaceflight. is there a relation between the enthusiasm (or lack of) for the space program and the ignorance on exactly how much is spent on the program? i have heard there were more than 400,000 people employed in private enterprise that worked on the program. and i think Michael Collins made a point that if all of the money spent on the space program was imediately moved over to health and social services, that money would be used in 2 weeks. my point is, that people don’t realise how little was spent compared to other budget expenditure (defence!) and also how many jobs were created out of the program. You are certainly right that most people have a poor understanding of how much money is spent on NASA and human spaceflight. This certainly has affected public perceptions. For example, A poll in 1997 indicated that Americans believed that NASA’s share of the federal budget was 20 percent. Had this been true, NASA’s budget in 1997 would have been $328 billion, whereas it was only about $14 billion. If NASA had that amount of money it would have been able to undertake a program to send humans to Mars. It would seem that the polling data suggests that people are not responding to what NASA in general and lunar exploration actually costs, but what they think it costs. This suggests that the polling being quoted is much less meaningful than meets the eye and that advocates of space exploration have a public relations problem rather than a political one. A related myth that gets popped as well, is the idea that space exploration is a marketing problem. 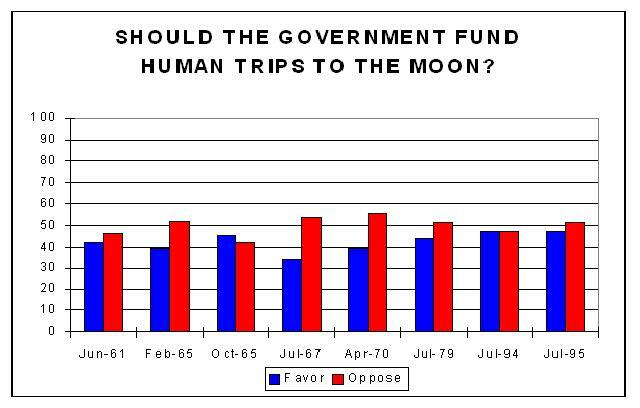 Note that the numbers for the “Should the Government fund trips to the Moon” poll in 1970 (after the effects of Apollo 11 had time to settle in) are little different from any other time from 1961 to 1995. If the single biggest PR event of manned space travel wasn’t enough to budge that poll, then what makes anyone think that better PR is the answer to NASA funding problems? I think your post is quite well done. I also think that the program’s popularity, both on TV and in the actual space exploration, would have been quite different if the decision was made to show the real goings on instead of boring the audience to death. Imagine the ratings if NASA showed the truth of what’s out there and marketed it like a real TV show? Great post Roger. I’m just discovering your blog. I will announce it to my blog readers as well. P.S. enjoying Robots in Space a lot. Michael. Glad that you found it interesting. I’m trying to do a couple of posts a week. Thanks for passing it on. But Roger, I was THERE! And everyone I know supported the Apollo program (or I set them straight real fast!) So, personal anecdotes trump the cruel statistics and color my perception of the issue. Great article! Nice history lesson on the amount of public support of NASA. Also, several members of Congress did not support NASA in the 60’s and 70’s and Congress had some close votes on NASA funding from time to time. However, the Apollo program was a great technological program. If wide spread public support is necessary, then the real questions are how can those folks who support space activity (both commerical and governmental) do a better job and why are the space advocacy groups failing to advocate well? The GSS was used in this analysis, but also Gallup, Roper, and other polls. I compiled the polling data over time to get the trends over several years. I did the bulk of this research in the early part of the decade and actually published an article in Space Policy about it in 2003. I hope this helps. One claim that we hear over and over again, especially in Congress recently, is that we need a robust space program to inspire the nation’s youth to become scientists and engineers. Even though I personally was inspired to study math and science and become an engineer by the early space program, I’m skeptical about how much of an impact that has nowadays. Has anyone conducted a study and polling to research that claim? I’d be interested in comparing how many were inspired by Apollo versus how many have been inspired by the Shuttle and ISS. Today, would more kids be interested in engineering to join the space program or to work for the likes of Apple or Google? Now the important question: What kind of space initiative would really have a strong impact on kids? My feeling is that it would have to be bold and adventurous, allowing us to do things and go places we’ve never gone before, plus have an entrepreneurial element to create new and exciting industries providing long-term, well-paying, and interesting careers. You are always one of the best antidotes to the prevailing ‘Cool-Aid.’ Keep up the good work! Rather than constantly trying to ‘triangulate’ public support, pleasing (i.e. feeding) the contractors, wooing Congress, suppressing honest dissent (especially internally), ‘controlling the message,’ etc., NASA needs to do something innovative, bold, creative AND relevant. To do so it must adapt which is the hallmark of any ‘learning organization.’ The sands of time have simply run out on the old paradigm. It is dying because it is no longer sustainable. What we are currently witnessing, from a historical perspective, is a birth process. Sometimes it’s hard to remember in the midst of all the screams, moans, body fluids and chaos the whole point is new life. I am hopeful but nineteen years in the business has taught me to be a realist. At this point in time, the prognosis is guarded. Thank you, Roger, for this excellent and myth-busting post. 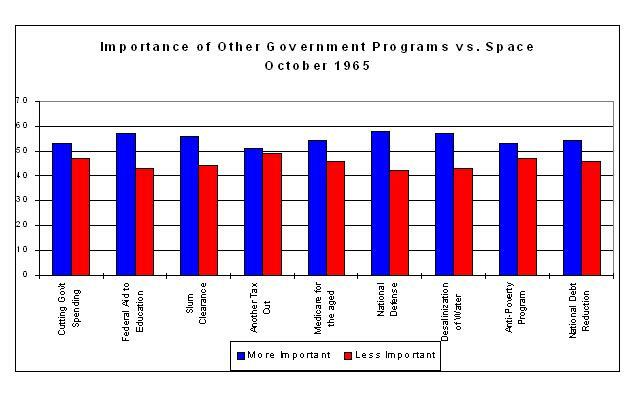 I am intrigued by the nuances of public support for NASA – and for federal programs in general. 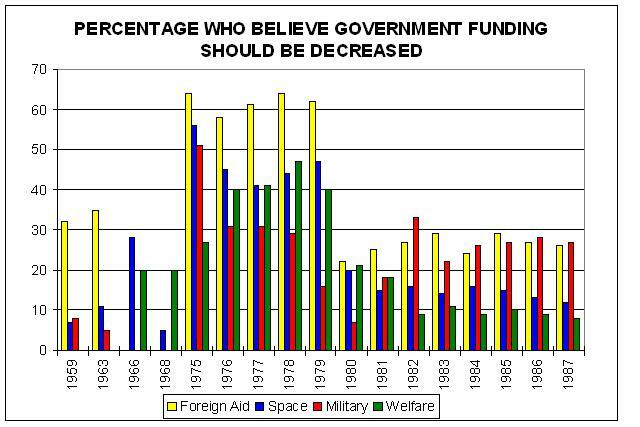 For example, the graph showing “Percentage Who Believe Government Funding Should Be Decreased” shows increased opposition to spending during the anti-government era of the mid-70s. Are there any comparative studies of public support for other federal programs that give some idea as to why support (no matter how lukewarm) for any particular program waxes and wanes? Is support solely built on how well the Agency does at communicating? (I doubt it, personally) Or are there other factors – such as perceived day to day value or personal immediacy? Many thanks, and Best Regards. That’s a very good question, Victoria. I’m sure that there are social scientists who have investigated this issue for other government programs but I haven’t looked into this. I think it would make a fascinating article. Would you like to take it on? I agree with you that this is not largely a question of how well the agency communicates. Linkages to key national concerns, values, and expectations I think are more significant. Late-comer to the blog but just have to comment. Kids don’t pay income taxes, adults do. The whole toy question might simply come down to that. For adults, the question probably comes down to whether we perceive that we are getting good value for our tax money spent. We adults are fine with our country accomplishing great things even if it doesn’t benefit us personally (e.g. the Olympics). But it would make a difference as to whether it cost a lot or relatively little. This is where smart architectures can make a real difference. Consider a public-private program (LunarCOTS.com) for establishing low-cost access to the Moon fueled by lunar polar ice. This would be a low-cost approach using smaller commercial launchers. Extending crew stay (and hence reducing crew rotation costs) and using the ice for water and oxygen means that such an approach would cost far less than the Apollo program while establishing the first permanent foothold for humanity off Earth. That would seem to be good value for the cost.